Continued from the front page. See below for details on how to help out. Since our humble and admittedly civilly disobedient beginnings, we have come a long way. Our present location in Sunderland Yard is our sixth and only location not arrived at in one of our popular shopping cart parades. And since we began both the purpose and the long-range vision of Dignity have become steadily more refined in the praxis of the village's historical development. Our purpose is to create a safe, sanitary, self-governed place to live as an alternative for Portland's poor, an alternative to the over-burdened shelter system where there are about 600 shelter beds for about 3500 homeless people, an alternative to sleeping alone in the doorways, under the bridges, or in the jails where we are occasionally housed for urinating in public, jaywalking, camping, whatever. Our vision is to create a green, sustainable urban village, built by and for ourselves using mostly donated and/or recycled materials, solar and wind power, composting toilets, and growing our own organic food in our gardens and on our farm. To read more about our vision, please see What We Propose To Do on the About Dignity page of this site. From December of 2000 until September of 2001, Dignity occupied a series of otherwise unused public spaces near downtown Portland, and grew in numbers to our largest size of 83 people. Each move was a celebratory occasion for another of our famous shopping cart parades which increasingly became community-wide events well-covered by the media. Eventually, on 4 September 2001 Dignity was forced under threat of a police sweep to move to Sunderland Yard, a city-owned leaf-composting facility seven miles from downtown. A supporter of the village paid rent to the city that we might remain in this space until 1 July 2002. Presently Dignity's relationship with the City has improved as we actively seek to locate and buy our eventual permasite. We face a number of challenges in our efforts to locate and purchase our own land where we can realize our dream and build what we are going to build. and be accessible for vehicles and wheelchairs. For another, compliance with conventional zoning and building codes is likely to be a significant challenge. Since we began, we have steadily improved our health and sanitation standards. Today the village has hot showers, four Port-O-Lets, dumpster service and several spacious heated common areas. The village is already meeting or exceeding the health and sanitation standards of temporary emergency-relief encampments sponsored by Red Cross, Corps of Engineers or Mercy Corps. Eventually we will move from tents to more conventional structures in a "phased development" approach that allows for incremental compliance. Dignity Village has always worked hard to maintain good relations with its neighbours, many of whom have become supporters. However, NIMBYism is alive and well in Portland as Dignity found out when we tried to rent a parcel in the Creston-Kenilworth neighbourhood in SE Portland last October. At a neighborhood meeting to consider the move, neighbours shouted down Dignity speakers and behaved in a most undignified manner (including one arson threat) which factored into the decision to stay at Sunderland until July. Now Dignity hopes to locate permanently in a neighbourhood that places a high value on social and economic diversity, under a Good Neighbour Agreement and with creative partnerships with Neighbourhood Watch and other neighbourhood-based livability initiatives. Dignity estimates that it will take at least $500,000 to purchase our permasite and to meet phase one construction goals. To raise these funds, we are planning a capital campaign, to provide local "match money" necessary to apply for major grants. Donations may be earmarked directly to our Land Acquisition Fund to help meet this major milestone to self-sufficiency. If you can provide volunteer assistance related to land search, neighbourhood advocacy, zoning/building codes, or know of possible funding opportunities, please contact Jack Tafari at bigtentcity@yahoo.co.uk, or Tim McCarthy at tim97211@yahoo.com. How Can You Help Dignity Village? Some suggested ways of helping are listed below. If you have questions, suggestions, or ideas please drop us a line using the contact information at the bottom of the page, or stop by the village! 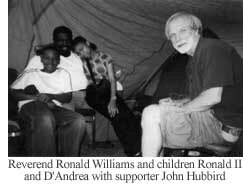 Dignity Village is a legal non-profit organization and all donations are tax-deductable. Help out with the items that we need. Write a letter pledging your support to our project. This is particularily helpful from local businesses. Send it to us at the address below. 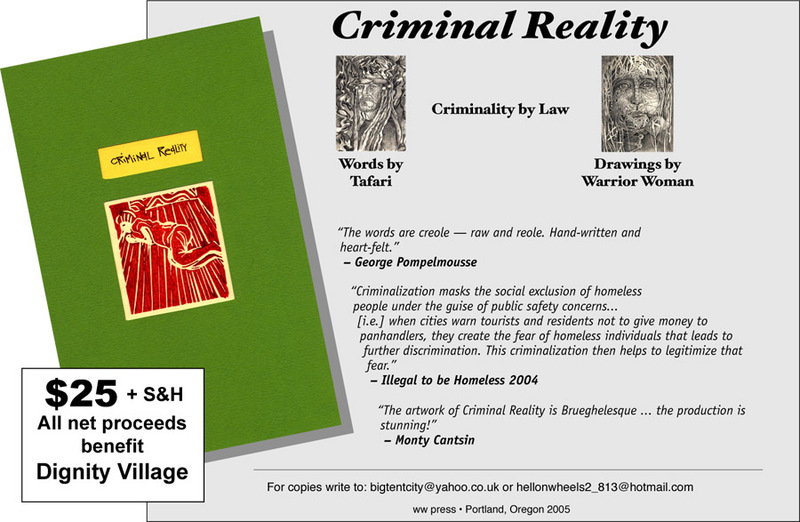 Buy our book, Criminal Reality. Buy a Dignity t-shirt, mug or tote bag. Proceeds go to our Land Acquisition Fund. Make a tax-deductible donation. Funds should be addressed to "Dignity Village", a 501(c)3 non-profic corporation, who oversees our monetary donations. Print out and distribute some of our documentation. Handouts and sign-up sheets to help people find out about us and get in touch with us. Sign up to receive our news updates and other important information.